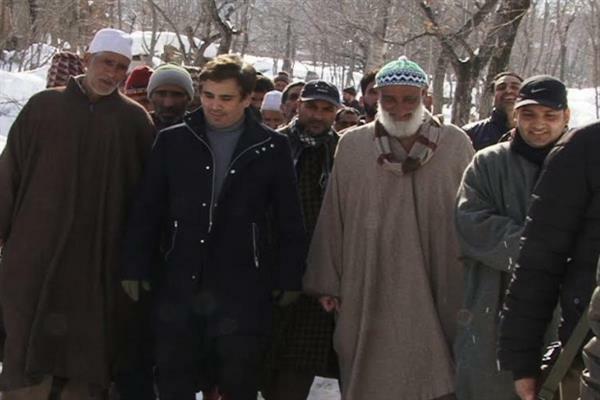 Khag, Feb 11 (KNS): On the instructions of party Vice President Mr. Omar Abdullah a delegation of National Conference on Monday visited the avalanche affected families in Mynar, Khag. The delegation comprised of Professor Abdul Majeed Mattoo and Political Advisor to Vice President Tanvir Sadiq. Tanvir later toured various locales of the Zadibal constituency where locals apprised him about the predicaments they are facing in the wake of heavy snowfall. Tanvir toured Gazi Doori, Omar Colony, Badamwari, Hawal, and localities of shahar- e -khas, where he had interaction with the people. “People have been left to fend for themselves. There is no accountability on ground. The field staff of SMC is not visible on ground. The by lanes and other interior routes are yet to be cleared of snow. The situation of electricity is no different. The inundated interior roads are revealing the grimy tail of neglect,” he said. Tanvir while touring the city areas made on spot phone calls to the District commissioner Srinagar and apprised him about the severe water logging at Omar Colony and other areas. In response to the phone call, manual staff was immediately rushed to the place to carry out de-watering of the area which has been facing inundation. Meanwhile Tanvir visited the fire affected families of the Gilkadal locality to extend his grief over the incident. Tanvir made on spot phone call to the Chief Engineer PDD and impressed upon him to restore electricity to the locality, which has been reeling under darkness due to the damage to local power transformer due to the conflagration incident that had engulfed the locality.